The LDAPS protocol: TLS encryption is used directly after the connection has been established. The STARTTLS command over the LDAP protocol: The connection is unencrypted until the client sends the STARTTLS command. For security reasons, Red Hat recommends enabling TLS encryption. You can use TLS with simple authentication using a bind Distinguished Name (DN) and password, or using certificate-based authentication. Directory Server's cryptographic services are provided by Mozilla Network Security Services (NSS), a library of TLS and base cryptographic functions. NSS includes a software-based cryptographic token which is Federal Information Processing Standard (FIPS) 140-2 certified. This section describes how to enable TLS in Directory Server. Create the databases if they do not exist. See Section 9.3.1.1, “Creating the NSS Database Using the Command Line”. Import the CA certificate. See Section 9.3.3.1, “Installing a CA Certificate Using the Command Line”. Import the server certificate issued by the CA. See Section 9.3.4.1, “Installing a Server Certificate Using the Command Line”. For a self-signed certificate, see Section 9.3.5, “Generating and Installing a Self-signed Certificate”. You need the nickname in the next step. By default, the name of the security device in the NSS database is internal (software). Optionally, update the list of ciphers Directory Server supports. For details, see Section 9.4.1.3.1, “Displaying and Setting the Ciphers Used by Directory Server Using the Command Line”. Optionally, enable certificate-based authentication. For details, see Section 9.8, “Using Certificate-based Client Authentication”. Optionally, create a password file to enable Directory Server to start without prompting for the password of the NSS database. For details, see Section 9.4.1.5, “Creating a Password File for Directory Server”. If you set a password on the NSS database and did not create a password file, Directory Server prompts for the password of the NSS database. For details, see Section 9.4.1.4, “Starting Directory Server Without a Password File”. Optionally, enable the Directory Server Console to use TLS when connecting to the server. See Section 9.4.2.1, “Enabling TLS for Connections from the Console to Directory Server Using the Command Line”. Optionally, enable TLS for the Red Hat Identity Management Console to use TLS. See Section 9.4.3, “Enabling TLS in the Administration Server”. Create a CSR. See Section 9.3.2.2, “Creating a Certificate Signing Request Using the Console”. Import the Certificate Authority (CA) certificate. See Section 9.3.3.2, “Installing a CA Certificate Using the Console”. Import the server certificate issued by the CA. See Section 9.3.4.2, “Installing a Certificate Using the Console”. Open the Directory Server Console and select the host name on the Configuration tab. On the Settings tab in the right pane, enter the LDAPS port into the Encrypted port field and click the Save button. The LDAPS port must be different to the one set for unencrypted connections in the Port field. Select Enable SSL for this server. Enable Use this cipher family: RSA, select the security device and certificate from the list. Optionally, click the Settings button to update the list of ciphers Directory Server supports. For details, see Section 9.4.1.3.2, “Displaying and Setting the Ciphers Used by Directory Server Using the Console”. Optionally, enable users to authenticate using certificates. For details, see Section 9.8, “Using Certificate-based Client Authentication”. If TLS is only enabled in Directory Server and not in the Directory Server Console, do not select Require client authentication. Select the Check host name against name in certificate for outbound SSL connections option to verify that the host name matches the cn attribute in the subject name of the certificate the client presents to the server for authentication. Red Hat recommends enabling this option in a replication environment to protect outgoing TLS connections against a man-in-the-middle attack (MITM). Make sure that the Use SSL in Console option is not selected. Do not enable the Use SSL in Console option before you finished this procedure, because it takes effect immediately after you save the setting. As a consequence, the Console fails to connect to the server. Optionally, enable the Directory Server Console to use TLS when connecting to the server. See Section 9.4.2.2, “Enabling TLS for Connections from the Console to Directory Server Using the Console”. Optionally, enable that the Red Hat Identity Management Console uses TLS. See Section 9.4.3, “Enabling TLS in the Administration Server”. Directory Server supports different ciphers, and you can enable or disable them. A cipher is the algorithm used in encryption. When a client initiates a TLS connection with a server, the client tells the server what ciphers it prefers to encrypt information. If the server supports at least one of these ciphers, the encrypted connection can be established using this algorithm. 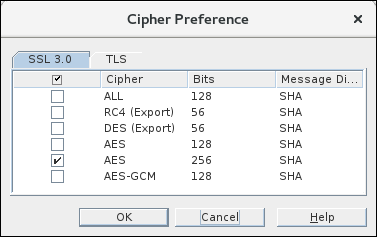 If you enabled encryption according to Section 9.4, “Enabling TLS”, you can display and update the ciphers Directory Server uses. This is only a list of available ciphers you can enable or disable. The list does not display the ciphers Directory Server currently uses. Directory Server uses the settings from the nsSSL3Ciphers attribute to generate the list of ciphers which are actually used. However, if you enabled weak ciphers in nsSSL3Ciphers, but set the allowWeakCiphers parameter to off, which is the default, Directory Server only uses the strong ciphers and displays them in the nsSSLSupportedCiphers read-only attribute. Display the list of currently enabled ciphers. See the section called “Displaying the Ciphers Directory Server Uses”. Optionally, display the list of enabled ciphers to verify the result. See the section called “Displaying the Ciphers Directory Server Uses”. On the Configuration tab, select the server name. Select the Encryption tab in the right pane and click the Settings button. Password entry required for 'Enter PIN for Internal (Software) Token:' (PID 1234). If encryption is enabled and a password set on the NSS database, Directory Server prompts for this password when the service starts. See Section 9.4.1.4, “Starting Directory Server Without a Password File”. To bypass this prompt, you can store the NSS database password in the /etc/dirsrv/slapd-instance_name/pin.txt file. This enables Directory Server to start automatically without prompting for this password. The password is stored in clear text. Do not use a password file if the server is running in an unsecured environment. warn: The Directory Server instance starts and log a warning about the expired certificate into the /var/log/dirsrv/slapd-instance_name/error log file. This is the default setting. on: Directory Server validates the certificate and the instance fails to start if the certificate has expired. off: Directory Server does not validate the certificate expiration date. The instance starts and no warning will be logged. This section describes how you configure the Directory Server Console to use TLS to access the directory. Before you can enable TLS in the Console, enable encryption in Directory Server according to Section 9.4.1, “Enabling TLS in Directory Server” and restart the instance. To configure an encrypted connection to the Red Hat Identity Management Console, see Section 9.4.3, “Enabling TLS in the Administration Server”. When you start the Console the next time, it automatically uses TLS for connections to Directory Server. Select Use SSL in the Console. Restart the Directory Server Console. Before you can enable these features, enable encryption in Directory Server according to Section 9.4.1, “Enabling TLS in Directory Server” and restart the instance. To use the same private key and certificate for the Administration Server as for Directory Server, see Section E.2.7.1.1, “Using the Directory Server Private Key and Certificate for the Admin Server”. Perform the steps in the Manage Certificates menu of the Administration Server Console instead of the Directory Server Console. The Administration Server and Directory Server must share at least one CA certificate to trust the other's non-shared certificates. On the Configuration tab, select the Administration Server entry in the left pane. Optionally, click the Settings button to update the list of ciphers the Administration Server supports. Optionally, enable client authentication using certificates. For details, see Section 9.8, “Using Certificate-based Client Authentication”. Set the LDAPS port of the Directory Server instance that stores the o=NetscapeRoot entry. By default, LDAPS uses the 636 port. Select Set User Directory and fill the fields. 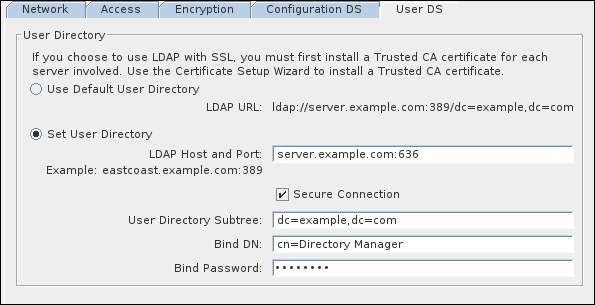 For encrypted connections, the Secure Connections option must be selected and the port port specified in the LDAP Host and Port field must support LDAPS. Optionally, create a password file to enable the Administration Server to start without prompting for the password of the Network Security Services (NSS) database. For details, see Section E.2.7.3, “Creating a Password File for the Administration Server”. If you did not create a password file, the system prompts for the password of the NSS database. To configure that the Console trusts the certificate, see Section 9.4.3.1, “Managing Certificates Used by the Directory Server Console”. The certificates and keys used by the server are stored in NSS security databases in the /etc/dirsrv/slapd-instance_name/ directory. The Directory Server Console itself also uses certificates and keys for TLS connections; these certificates are stored in a separate database in the user's home directory. If the Directory Server Console is used to connect to multiple instances of Directory Server over TLS, then it is necessary to trust every CA which issued the certificates for every Directory Server instance. When TLS is enabled for the Directory Server Console, the Directory Server Console must have a copy of the issuing CA certificate for it to trust the server's client certificates. Otherwise, the Console will return errors about not trusting the CA which issued the certificate. Only the CA certificates for the CA which issued the server's certificate is required. The Directory Server Console does not require its own client certificate.